A document is the name given to a Word file and has the file extension (".doc") and is made up of one of more pages. 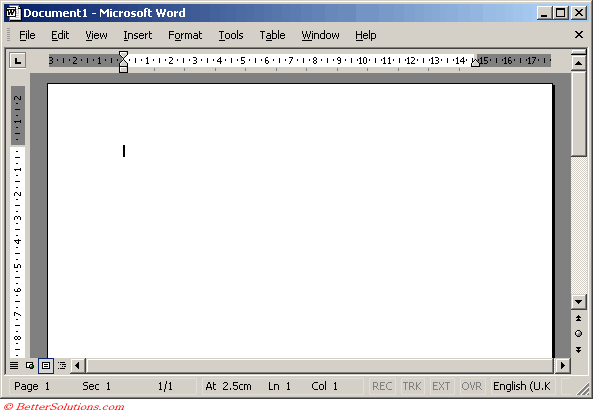 Word can be used to produce letters, reports, faxes, brochures, newsletters etc. You can also use templates to help design consistent looking pages easily. Every time Word is started a new blank page in a new document will be created. The default naming convention for documents is Document1, Document2, etc. When you open Word there are actually two separate windows. Both of these windows have what are called control menus. The icon in the top left corner is known as the control menu and the three buttons in the top right hand corner provide shortcuts for commands on this menu. You can also display the control menu by pressing the left mouse button on the icon in the top left corner. The outside window is the Title Bar or Application Window. This window displays the name of the application and the name of the active document. The document name will only have a file extension once it has been saved. Minimise - Word is reduced to a button on the taskbar. Restore - Restores the application window to its original size before it was maximised or minimised. Maximise - Increases the size of the Word window to fill the whole screen. Close - Closes Word completely. The inside window is the Menu Bar or Document Window. Minimise - Document is reduced to a small icon within Word. 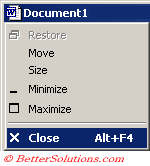 Restore - Restores the document window to its original size before it was maximised or minimised. Maximise - Document is increased to fill the whole application window. When the window is maximised this button changes to restore. Close - Closes the active document. The Minimise and Restore buttons are only displayed when your (Tools > Options)(View tab, Windows in Taskbar) option is not checked. How can I create a Document ? When you start Word a new blank document and a blank page is automatically created for you. You can easily create a new blank document by selecting (File > New) and clicking on the Blank Document hyperlink in the New Document task pane. You can also use the shortcut key (Ctrl + N). Alternatively you can use the button on the Standard toolbar. New Blank Document - Creates a new document with a single page. When a document is open the name of the document is displayed in the title bar (top left corner). If the name of the document does not have an extension associated with it, then the document has never been saved. By default every new document consists of a single page. How can I open a Document ? You can open a presentation by selecting (File > Open) or by using the shortcut key (Ctrl + O). Open - Displays the (File > Open) dialog box. When you display the (File > Open) dialog box, a default folder location is used. This can be changed from (Tools > Options)(File Locations tab, Documents). If you save all your documents in the same folder it is definitely worth changing your default folder. You can also double click a Word file from within Windows Explorer. Word files have the file extension (".doc"). If Word is not currently open then it will open automatically. You can also open a file using the Recently Used Menu. This is located at the bottom of the File menu (see below). Microsoft Word is the only application that displays the folder path as well as the file name. By default your last 4 Word documents that have been opened using the (File > Open) dialog box will be listed here. You can select one of these to quickly re-open the document. You can change the number of files listed here by selecting (Tools > Options)(General tab, Recently used file list). This can be a number between 1 and 9. This list of recently used files is also displayed at the top of the New Document task pane. If you attempt to open a Word document that is already open the file will not be opened again. You will not receive a prompt. How can I save a Document ? It is good practice to save your work frequently especially when you have just made substantial changes. You can save the active presentation by selecting (File > Save) or by using the shortcut key (Ctrl + S). Save - Saves the active document. When you save a document for the first time the (File > Save As) dialog box will be displayed. You can save your files with a different name or in a different location by selecting (File > Save As) or by using the shortcut key (F12). There is also an AutoRecovery feature that can automatically save a document recovery file on a periodic basis. AutoSave should not be used as an alternative to saving a document using (File > Save) but just as an extra safe guard. Closing documents when you have finished with them can be done in several ways. The easiest way is to select (File > Close) or by using the shortcut key (Ctrl + W). You can also close the active document by clicking on the icon on the left of the Menu Bar. You will be prompted to save the changes when you close a document that has been changed since it was last saved. If you close Word when there are documents open, a dialog box will be displayed for each document that has had changes made to it. How can I close Word ? The easiest way to close Word by selecting (File > Exit) or by using the shortcut key (Alt + F4). You can also close Word by clicking on the icon on the left corner of the Title Bar and selecting Close. Another alternative is to press the black cross on the control menu in the top right hand corner of the Title Bar. All documents are automatically closed when you try to exit Word if the following option is checked. If you quit Word when several documents are open and are not saved you will be prompted with a "Save All Open" option which allows you save and exit them all without being prompted individually ???? (File Locations tab, Documents) - Lets you change the default folder used by the (File > Open) and (File > Save As) dialog boxes. (General tab, Update automatic links at open - Automatically prompts to update any links to other files or fields linked to external data sources. (General tab, Recently used files list) - Lets you change the number of documents displayed at the bottom of the File menu. (User Information tab, Name) - Lets you enter your username. 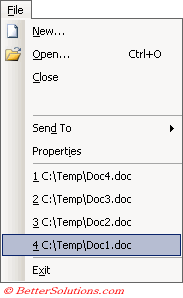 This will automatically appear in the (File > Properties)(Summary tab) when you create a new document. It enabled you to keep track of who creates the document. You can also use the shortcut key (Shift + F12) to save a document. You can also use the shortcut key (Ctrl + F12) to display the (File > Open) dialog box. It is possible to go back to the text you were working on before you closed the document last. Press (Shift + F5) as soon as the document is open. After long periods of time writing or editing a document, save and close Word completely and reopen it. This will allow Word to tidy up all its temporary files that it has created whilst you have been busy working. A document contains one or more sections. A section contains zero or more paragraphs.